Prepare your specialty dishes on the Atosa ATO-2B48G 60" Gas Range with (2) Open Burners and 48" Right Side Griddle, (2) 26 1/2" Ovens. 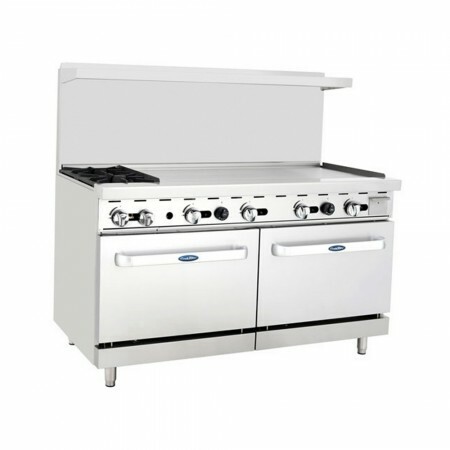 A great addition to restaurants, catering companies and other food service facilities, this gas range is constructed from non-corrosive stainless steel which is exceptionally strong to keep up with the rigors of high volume use. 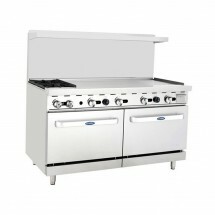 Thanks to its cast iron top grates with grease trough and built-in bowl, this gas range is hassle free to cleanup. Equipped with 2 heavy-duty lift-off cast iron burners, 2 ovens and a griddle plate, this gas range is perfect for simultaneous cooking. 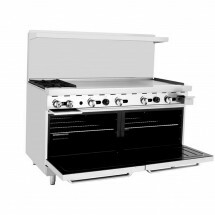 This functional and economical gas range comes with 1-year warranty for parts and labor. (2) Heavy-duty lift-off cast iron burners, 25,000 BTU/hr. Dimensions: 60" x 31" x 56 3/8"